Laocoon was a famous seer in Greek mythology, and one closely associated with the city of Troy. Indeed, Laocoon would die at Troy during the Trojan War, but the seer did not die on the battlefield, but was instead struck down by the gods. Laocoon was said to be the son of a man named Acoetes, and by an unnamed woman would become father to two sons, Antiphantes and Thymbraeus. Laocoon would become the chief priest of Apollo (or Poseidon) within Troy, and it has to be assumed that it was Apollo who gave Laocoon the skills needed to see into the future. Troy was actually blessed with a number of skilful seers with Helenus, Cassandra and Laocoon all highly regarded. Helenus though would leave Troy when he saw the disaster that laid ahead, and Cassandra was cursed so that her truthful prophecies were never believed. Laocoon was also highly skilled but the Trojan seer was famous for the manner of his death; a death linked to the downfall of Troy. As the Trojan War dragged on, eventually the idea of the Wooden Horse was put into practice, and the gigantic horse was left behind as the Achaeans made it look like they were withdrawing from the battlefield. The people of Troy rejoiced, and having been convinced by the words of Sinon, an Achaean “accidentally” left behind, were making preparations to bring the Wooden Horse into the city of Troy. Laocoon observing the foolishness of his fellow Trojans left the temple of Apollo and rushed down to the shoreline to dissuade them from bring the horse into Troy. Laocoon proclaimed “I fear the Greeks, even when bringing gifts” (hence the phrase beware Greeks bearing gifts), and throwing a spear against the side of the horse, told his countrymen that they must burn the Wooden Horse. As Laocoon sought to convince the Trojans, so Athena caused an earthquake to shake the land, and when Laocoon continued to argue his case, the goddess caused him to be struck blind. 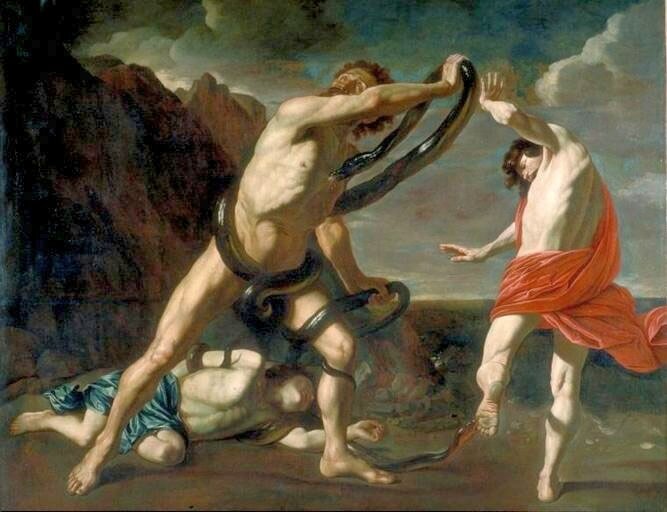 Even so Laocoon continued to speak, and so finally Athena sent forth two serpents who attacked and killed the two sons of Laocoon, Antiphantes and Thymbraeus. ​Laocoon went to help his sons, but the Trojan seer is normally said to have been killed by the serpents as well, although others say he survived but left a shell of his former elf by the loss of his sons and his sight. Others say that it was Apollo or Poseidon who was responsible for the downfall of Laocoon. As to the reason why any of the gods would intervene varies. Athena was of course a supporter of the Greeks, and the Wooden Horse was said by some to be devised by her, and it was certainly dedicated to her. Thus the striking of it by Laocoon would be sacrilegious. Poseidon of course was also no friend of Troy, and had, a generation previously, sent a sea monster against the city. Apollo though was a defender of Troy, and indeed Laocoon was his chief priest, so why would Apollo attack his own priest? An argument is given, that Laocoon had angered Apollo by not remaining celibate, as the god expected of his priest, or perhaps Laocoon had dared to sleep with his wife in the temple of Apollo. Thus, the timing of the death of Laocoon had nothing to do with the Wooden Horse. The words of Laocoon might have convinced the Trojans to burn the Wooden Horse, unlike the words of Cassandra, but when the Trojans saw the injuries that befell Laocoon the felt that his words could not be the truth. Thus the Wooden Horse was taken into the city of Troy and placed by the shrine of Athena, an act that would ultimately bring about the downfall of Troy, as from the belly of the Wooden Horse would later emerge the select band of Greek heroes.